Kevin Wall wants to get you leads. He’s the founder of postAprop.com, and helping real estate agents is at the core of their mission. Kevin started with a company called BestSqueezePages.com, using a term that refers to landing pages. Landing pages are a specific kind of web page: they are meant to capture information and convert. More than informational, landing pages are very specific in their calls to action: Sign up. Register. Call now. And they are a key part of any marketing strategy, in particular for real estate agents. Kevin got so many requests from agents who were using his squeeze pages, he built a platform just for them. This product helps agents easily create unique landing pages as well as individual property listing pages. The annual subscription also includes email marketing tools. And digital ads are the missing link. That’s where Adwerx digital advertising comes into play. “I’m a big fan of Adwerx,” said Kevin. “But I think agents could be doing a better job of using the ads.” Kevin explored how Adwerx brand awareness ads could be tweaked for lead generation in his own blog post. He says lead generation is all about where you send your traffic. “Home pages aren’t designed to capture leads. Home pages are informational. 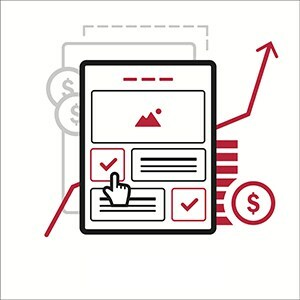 But if you use a brand awareness ad, you should have something to let users do when they get to your site.” And that’s where a landing page comes in. Kevin had some helpful tips to share with real estate agents, helping them do more with digital ads and landing pages to create more leads. Your USP is what differentiates you from the competition. Maybe it’s a specific neighborhood. Maybe it’s working with first time buyers. Make your message and your value proposition clear on your ad. Once you put that message out on your ad, be sure your landing page continues the conversation. Which brings us to Tip #2. The very specific message you created on your digital ad should carry through on your landing page. A landing page isn’t where you tell your entire life story and highlight all your listings. A landing page has a targeted purpose: a listing, a neighborhood or even a specific town. Your photos and your copy should all support that singular focus. Keep in mind, people consume advertising with one thought, “What’s in it for me?” Answer that question as quickly as you can with something of value: a downloadable market report. A home value assessment. A newsletter with tips on buying and selling in your area. It’s tempting to fill your page with multiple links and information capture forms. But keep it simple. Don’t litter it with photos and videos and long paragraphs of copy. Make it clear what you want your visitors to do. Of course, postAprop.com can simplify many of these tips with their platform. No coding skills needed. No design background required. Kevin Wall is confident his product is ready to help. In fact, he offers a free guide for agents to download. Do You Need a Real Estate Marketing Company? Adwerx mobile advertising for real estate is here!